-Gauge with rubberized protector and dual color scale, tests up to 0-300 PSI and 0-20 kPa. 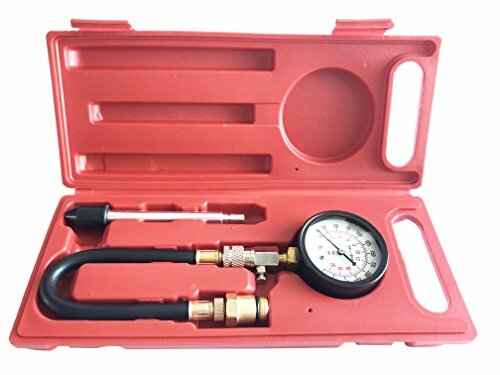 -Air gauge with quick coupling & pressure release button. -Easy to read gauge. Dual Gauge Readings: 0~300psi durable rubber hose with M14*1.25 / M18*1.5 adapter. -Heavy-duty stem with rubber cone cap fits different spark plug holes. -Includes carrying case for easy transportation and storage. 1.Start the engine and run to normal operation (cooling water temperature 70-90 °). 2.The engine stops working, remove the dirt around the spark plug and remove the spark plug. 3.Place the throttle choke in the fully open position. 4.Press the tapered rubber joint of the cylinder pressure gauge against the spark plug of the cylinder to be tested (or screw the threaded pipe joint onto the spark plug hole). 5.Use the starter to drive the crankshaft to rotate for 3~5 seconds (not less than four compression strokes). Read the reading after the pointer is stable, then press the check valve to zero the pointer. 6.Repeat the previous step, the number of measurements per cylinder is not less than 2 times, and the measurement results should take the average of the number of measurements. 7.According to the above method, measure each cylinder in turn. If you have any question, please contact us. We will help you handle the problem as soon as possible. If you have any questions about this product by GooMeng, contact us by completing and submitting the form below. If you are looking for a specif part number, please include it with your message.